“Please be aware that there are people in this city who make it a career to get inside your bags without you knowing.” Those were the cautious words of one of my tour guides during my recent European vacation. They were talking about gipsies and other career criminals who can zip and unzip a purse or backpack without you feeling a thing. I looked down at my backpack and pocket purse and smiled to myself. 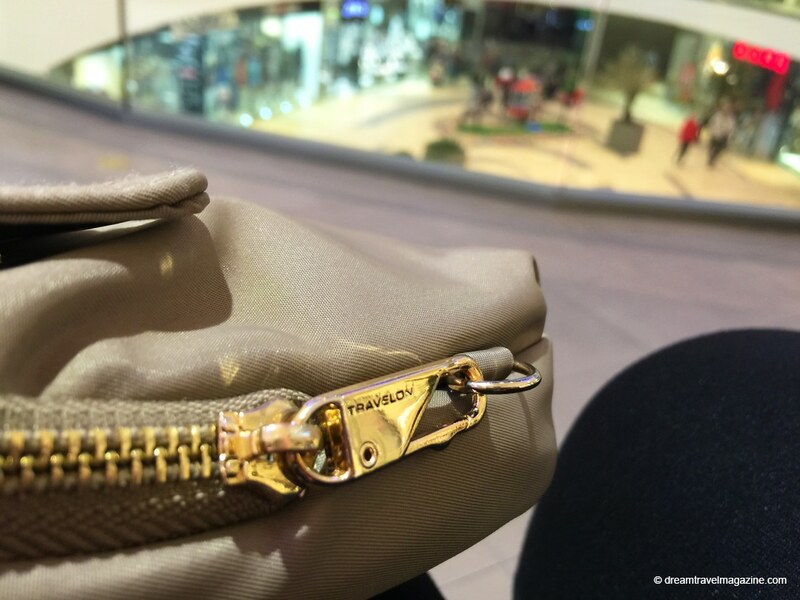 I was travelling with my Travelon Bags, and the zippers were securely clasped in place. 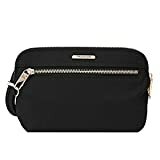 Travel with stylish anti-theft bags has become a must for me and with this Tailored Collection you will always look fashionable. I was on a 2-week vacation in Croatia, which included stops in the bustling cities of Zagreb and Dubrovnik. With thousands of visitors a day and the narrow streets of their old towns, I found myself walking in crowds of people all bumping into me from every angle. 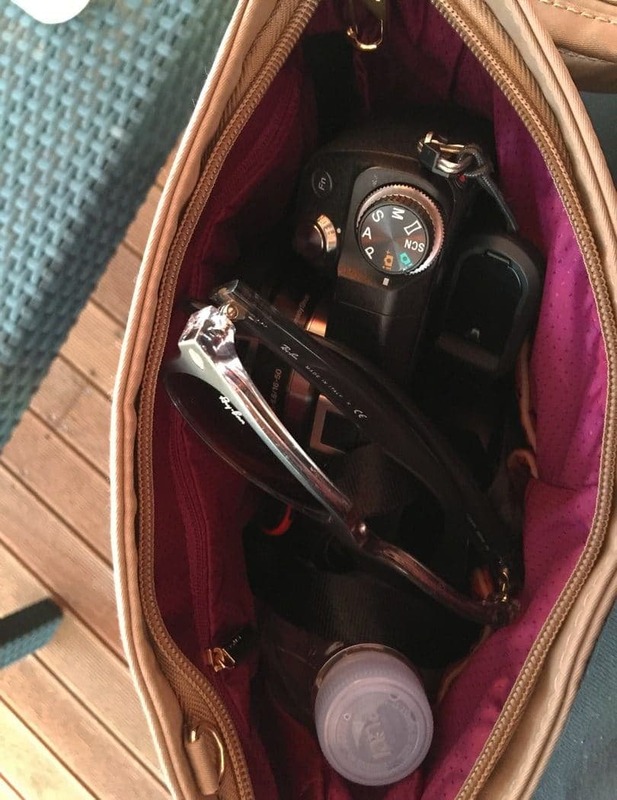 Add to that my lovely shiny camera with the huge zoom lens attached to it hanging around my neck and I instantly become the female tourist with the big camera who has a backpack probably filled with more camera equipment. I’m also frequently running around these cities on my own. Since I have a photographer’s agenda, my travel companions ditch me to let me do my thing. So imagine me. In a crowded city like Dubrovnik, with a backpack, an enormous shiny camera on my neck, juggling my iPhone and sometimes a tripod or selfie stick. I’m all engrossed in taking the shot. There is no one around to watch my back for pickpocketers. I have to start this post with my classic Travelon Backpack. 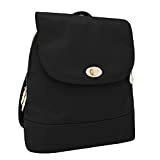 It is my go-to stylish anti-theft backpack for all my trips. 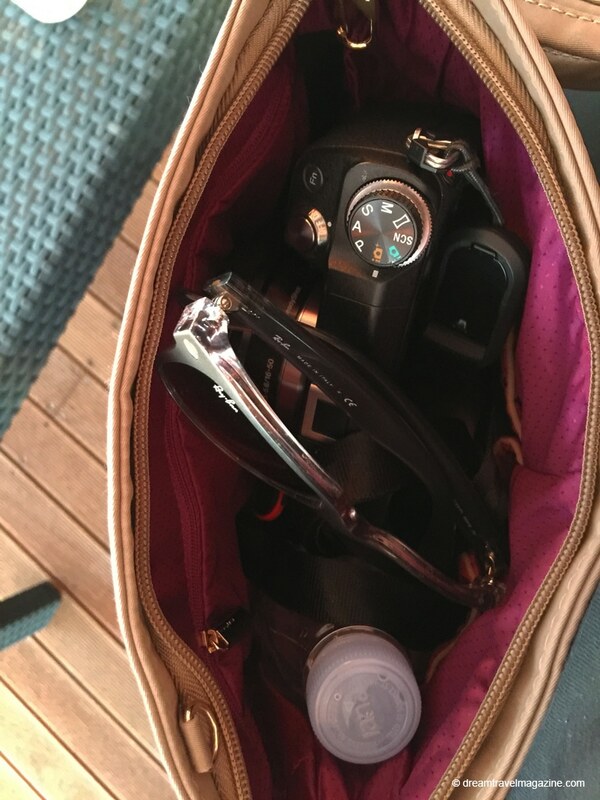 The perfect size for everything I need for the day – including camera gear, a bottle of water, my iPad and more. 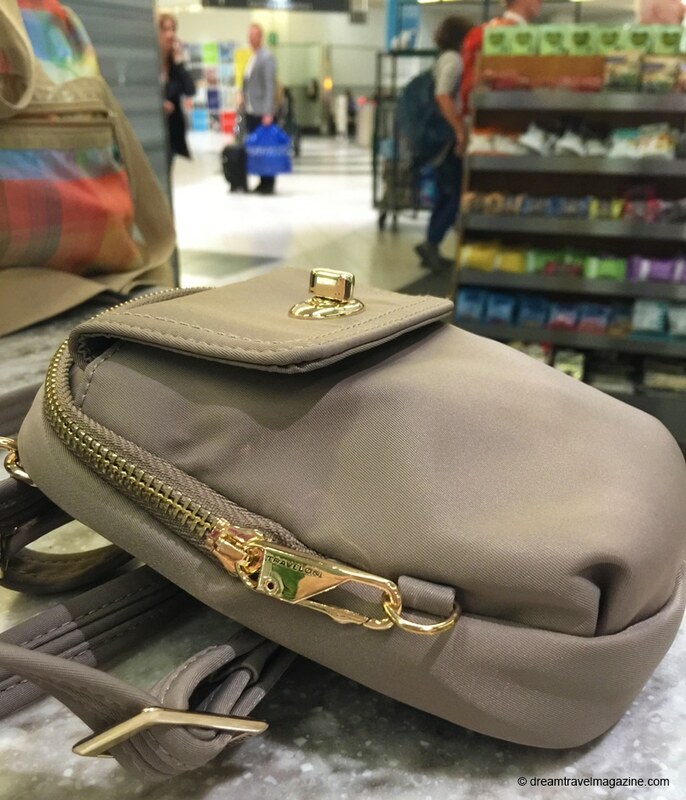 See the full review in this post: Travelon Anti-Theft Classic Backpack. The locking zippers are more peace of mind that you can imagine, especially on busy transit systems, streets or in crowded festivals. What does safe travel mean to you? 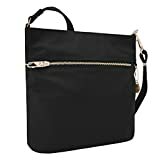 For me, I love this company’s stylish anti-theft bags because they offer roomy bags with lots of pockets for organizing your essentials but also include security features like slash proof material in the bag’s body and straps, RFID slots and pockets for ID and credit cards and clasped zippers that lock compartments securely. 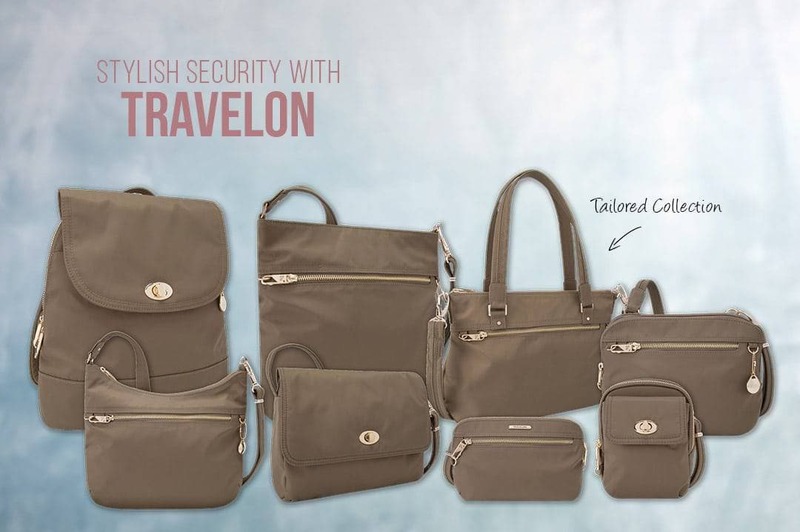 Travelon continues to inspire (and entice) me with their new collections. 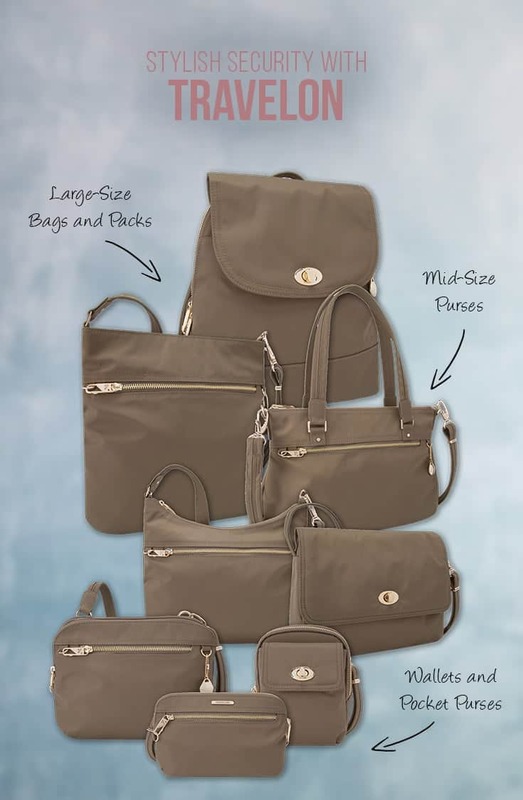 Not only are they offering travel bags with security features I love they are stylish too! I’ve now expanded my collection with some elegant and secure looks from their Tailored Collection. Here are a few of my favourites and why! 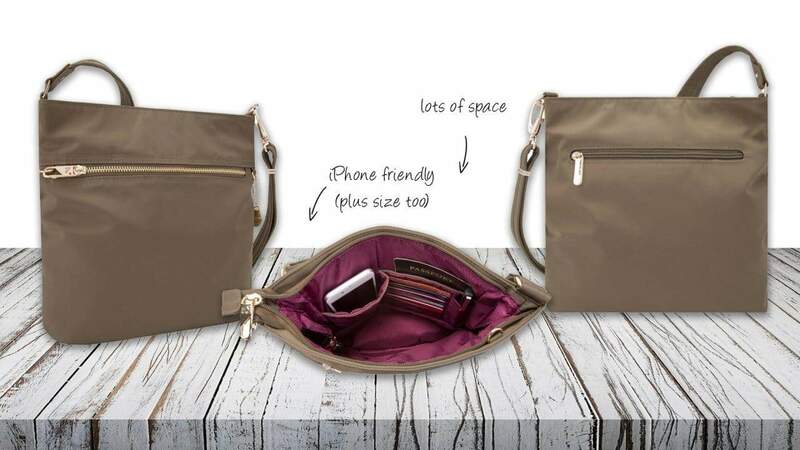 I love this bag for its basic functionality. 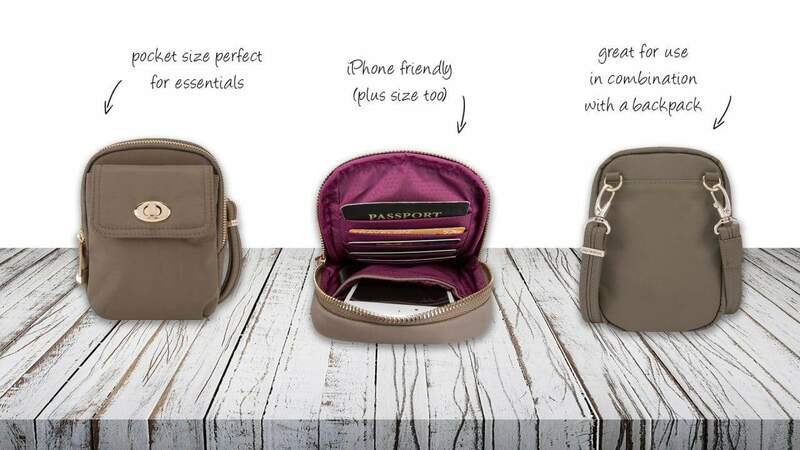 It’s a spot to store money, passport and a phone. 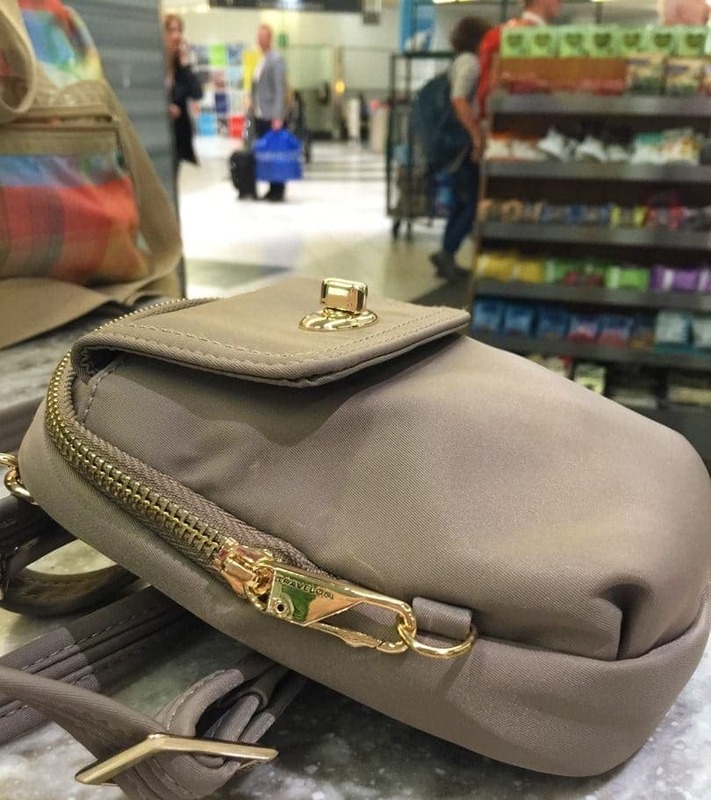 What I like about it is I can wear it while running around the airport with quick access to my passport or phone where I store my boarding pass or while running around the city with my backpack. It means that every time I need some change for a coffee, or to check my phone I don’t have to take the backpack off my back and open it up and rummage through it looking for whatever little thing I need. 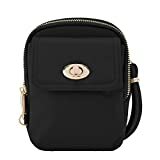 It is all there in this little purse that weighs nothing. It’s so small I can store it easily in my backpack when I need to. 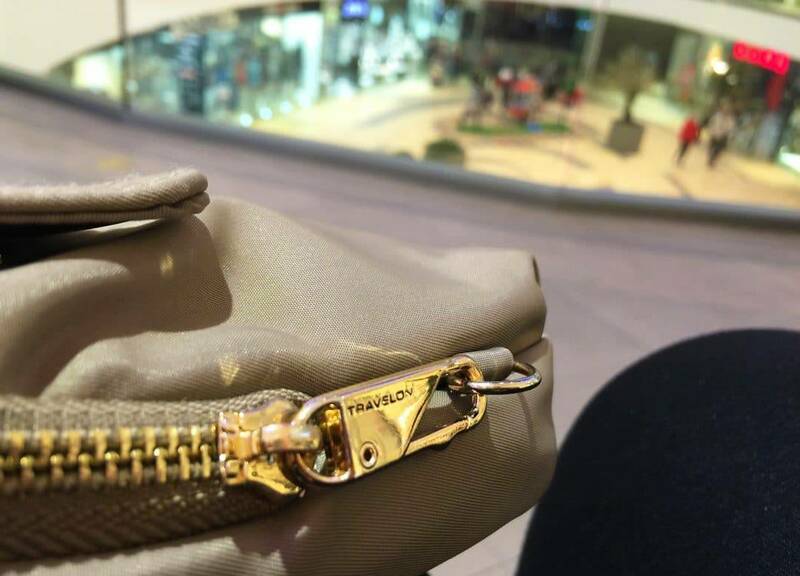 I like having purses where everything has its place. 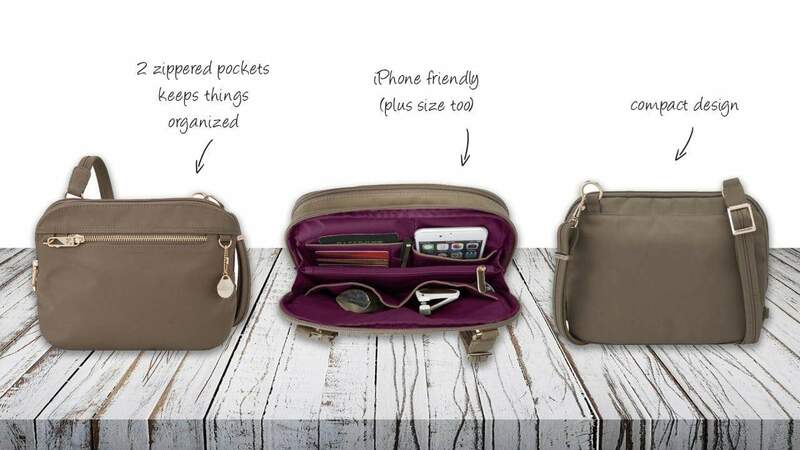 This Travelon organizer is the perfect bag for this purpose. 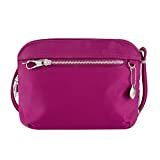 I also love it, because it is a compact bag isn’t heavy and bulky. With a smaller camera lens, it even had room for my mirrorless camera. 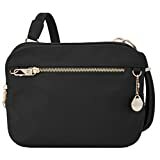 On trips, I love taking this bag with me to restaurants or on evening walks when I don’t need all my camera gear but still like to carry around a few essentials. 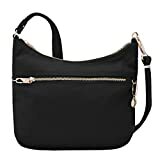 This saddle bag is great when you want a slim purse with a large compartment for all your essentials. 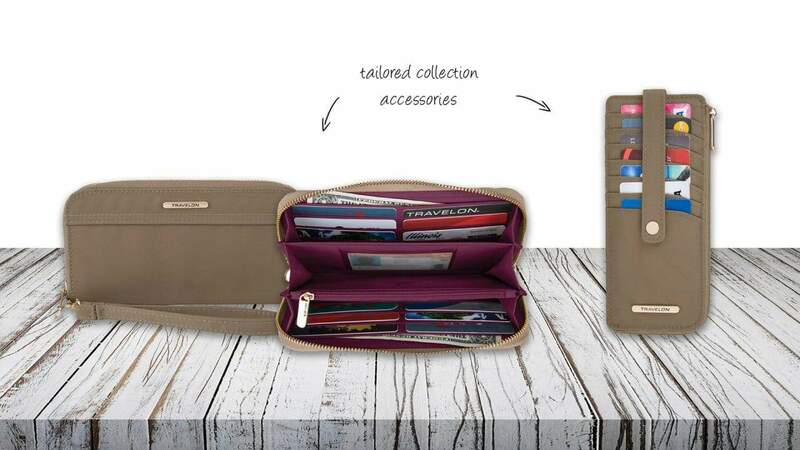 Another great feature of Travelon are the many great travel accessories they provide. 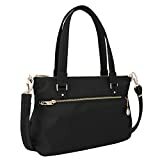 If you are a matchy, matchy type fashion girl, many of these accessories come in the colours and styles of the purses, luggage and bags. For more from the Travelon Tailored collection visit the Travelon Website here. Disclosure: I did not receive compensation for this post. I was given a sample of products to review from Travelon. It was very useful for me. Keep sharing these ideas in the future as well. This was actually what I was looking for, and I am glad I came here! Thanks for sharing this information with us.